We wish to introduce ourselves as one of the latest popular destinations for holiday retreat and business in PANGKOR ISLAND. CORAL BAY RESORT offers you luxury and comfort within your budget - Located on this very peaceful and well reserved island, it provides 142 stylish furnished hotel rooms and 70 service apartments for your comfort and convenience. 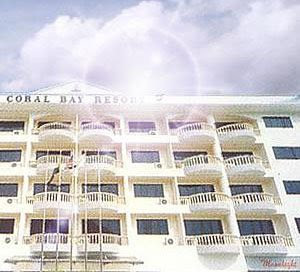 Be it for business or pleasure, CORAL BAY RESORT gives you an obviously affordable accommodation with easy accessibility to major places like the 'airport (7km), jetty and 'Pangkor town (2km). Most of all, a rare opportunity to enjoy the white sandy beach (100m), amidst refreshing, beautiful surroundings.